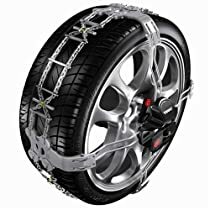 The K-Summit is the ultimate snow chain on the market today. The K-Summit is uniquely designed to ride on only the external surfaces of the tire so you don't need to worry about clearance issues on the inside of the tire or interference with ABS braking, suspension or steering components. The K-Summit is also one of the easiest chains to install in three easy steps. You simply lay the chain on the tire, attach it to one of the bolts, activate the ratchet and you're done. The chain automatically self-tightens and self-centers itself as you drive away. You don't need to keep other components mounted to the wheel over the winter like other chains. The K-Summit was produced in Italy and the craftsmanship and attention to detail are evident. It is made of special alloy plates and strengthening ribs along with zinc-plated pins and hard metal core rivets all designed for maximum grip, endurance, reliability and resistance to abrasion and laceration. The geometric design of the arms and the high toughness of the material won't allow the chain to come off the tire, even in extreme conditions. In addition the innovative ratchet system has a force multiplier of nine times so it allows effortless fitting and a safety lever to avoid accidental openings.